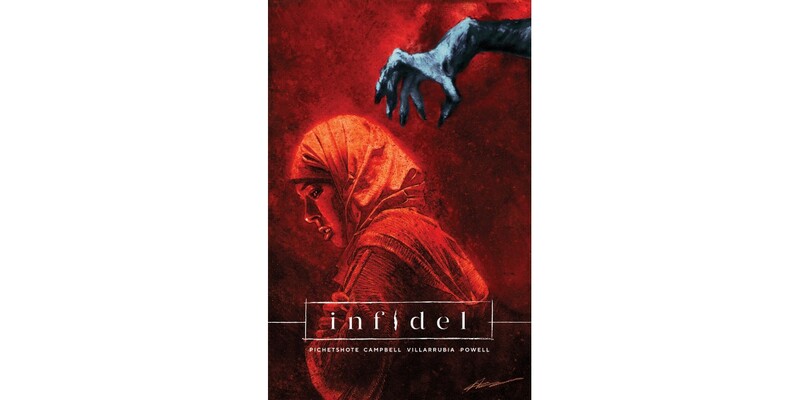 PORTLAND, OR, 6/26/2018 — The complete series of the critically acclaimed, powerful new horror story INFIDEL—by bestselling writer and former Vertigo editor Pornsak Pichetshote and artist Aaron Campbell—will be collected into trade paperback and available this September. This tautly woven series tackles controversial topics in race and racism and how it can affect people from different cultures and landed a movie deal after just two issues, with The Hollywood Reporter breaking the news that Michael Sugar (Academy Award-winning producer of Spotlight for Best Picture) and TriStar will adapt the series for the big screen. INFIDEL trade paperback (ISBN: 978-1-5343-0836-7, Diamond Code JAN188523) will collect issues #1-5 and will hit stores on Wednesday, September 26th and bookstores on Tuesday, October 2nd. The final order cutoff for comics retailers is Monday, August 13th. It can be ordered on Amazon, Barnes & Noble, Books-a-Million, IndieBound, and Indigo.